When you don’t have a balance in hand but need household items as a reference for a gram, what can you pick that will weigh a gram ? I’ve searched my home and checked using an electronic precision scale in order to select what items that weigh 1 gram. See also the Gram to oz converter at the bottom of this article. 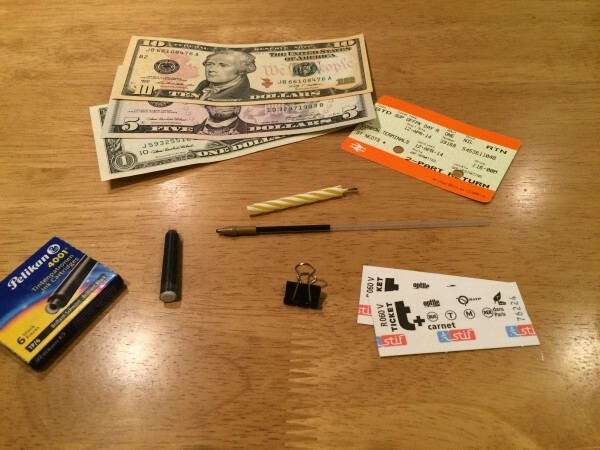 A Dollar note, a paper clip, 2 Paris metro tickets, an England train ticket, the core of a pen Bic Cristal, a small ink cartridge. Any dollar note. According to the US Bureau of Engraving and Printing, a dollar bill weighs exactly one gram. This is the same for any dollar note. I’ve checked by myself and this is true. Two paris metro tickets. One of those tickets only weigh half a gram. If one day you visit this city, you may end up with some in your pocket. a 2″ birthday candle. Preferably not used. A UK train tickets. That is also true for a tube ticket, or Underground, the metro of London. If you are one of the 6 million tourists that visit this city every year, you will bring some of those in your souvenirs. a coin of one Yen of Japan, one fifth of a sheet of paper, a pinch of salt, a raisin, a stick of gum, 1 milliliter of water or 1/3 or teaspoon of water. The word “gram” comes from Latin “gramma”, meaning ‘small weight’. It is abbreviated g, not to be confused with a “grain” that is a unit of measure of a grain of cereal (wheat or barley) but also for gold nuggets and abbreviated gr. The gram is the smallest unit of weight in the Metric System. It is equivalent of the weight of a cubic centimeter of pure water at 4 degrees Celsius, or 1 milliliter (1/1000 litre) of water. Smaller units are expressed in fractions of grams, e.g. a milligram (mg) is a thousandth of gram, and higher units are multiple, like a Kilogram (or a Kilo, abbrev. Kg) is a thousand grams. A metric ton is a thousands of Kilograms, which means it weighs a million grams. The gram is commonly used in pharmaceuticals, for the weighing of molecules in medicines and tablets (eg Penicilin 500mg) and in nutrition labels for food products. 1 gram is equivalent of 0.0353 dry ounces, 0.002 pound. For more information about the Gram and the metric system, feel free to see the Wikipedia page about those topics. or try this online Grams to Ounce Converter. UK – Aviagen explains how weighing eggs can tell you a lot about the needs of your birds. For all the mechanical sensors (thermometers, humidity sensors, air quality sensors and even weighing scales) that can be installed in a house, the best sensors of all are the birds themselves. Observing their movements, their positioning on the floor, other behaviour and even their produce (eggs) can tell you a lot about their needs. Whilst weighing eggs and monitoring changes in egg weight might not seem a priority, the information which can be gained from this practice can be invaluable. The key is to combine monitoring of daily egg weight with trends in bodyweight. Egg weight and changes in egg weight can often be an early indicator of less than optimum nutrition intake. A change in egg weight will be noted before an effect on production occurs. A drop in egg weights implies inadequate nutrition, while over-feeding and excess nutrient intake will lead to a rise in egg weight. Using daily egg weight in conjunction with bodyweight trends provides the farm manager with information which will allow any issues to be detected early, aiding accurate management decisions of bird feed allocation during production. There is a tradition in High Wycombe, United Kingdom that consist in weighing the ruling politicians in public in order to see if politicians and dignitaries have been “overindulging” during their time in office. This year, the newly elected mayor, Cllr Hanif said he is proud to become the new mayor of the town and wants traditions like the mayor weigh-in event to continue. According to folklore, the ceremony began when a visiting monarch observed the mayor being drunken disorderly and declared that any future mayors will be weighed at the start and end of their tenure. In China, a man went into a car dealer showroom in Shenyang to buy a brand new car. He did pay the full price for the vehicle with coins and only a few bank notes. The full payment from Mr. Gan weighed at least four tons. More than 10 employees went through 1,320 bundles of coins wrapped in brown paper, which placed in a pile stood over 12 feet tall. It took several hours for them to count and filter the coins until they emptied Gan’s truck, according to Shanghaiist. The buyer used that pile of coins to purchase a SUV that cost $109,700 (680,000 yuan). He paid $106,480 (660,000 yuan) with coins and the rest of the amount with small bank notes. Gan said that he was saving the money over the years. Because he works in a gas station, he would most often receive payments in small coins and small denominations notes. “Our station is in the suburbs, there are very few banks. So we didn’t deposit the coins and decided to use them to buy a car for our company,” he said, according to the BBC. In order to be considerate, Gan took care to tell the car dealership about his method of payment ahead of time. He feared to be turned away, but the car dealer gladly accepted it and was prepared for his arrival with weighing scales and a full-service staff, according to News Corp Australia. Chinese media reported that this is not an unusual event in China to pay big tickets items with large hoard of coins. The down payment for an apartment was paid by a man in Fujian using 100,000 coins, and a woman in Zhengzhou paid for a BMW in a manner similar to Gan, according to World Car Fans. Spring scales are weighting balances that need to be hung to make their measurements. They are made of a spring with a loop at the top end for fixing and a hook at the other end to hang what need to be weighted. The first record of a spring balance is found in Great Britain around 1770 near Wolverhampton. The inventor incorporated the company of George Salter & Co., who patented the spring balance in 1838. A spring scale is are also called Spring Balance is very simple: it only uses gravity and Hookes law to operate. However, it only measure mass (the force of gravity) and not weight and the reading may depend of where you are on the Earth surface. For that reason they are marked with a mention similar to: “no legal for trade”. Because of their simplistic conception, competitive cost, robustness, ease of use and rapidity, it is a very popular way to take quick measurements that don’t need to be 100% accurate, like babies weighting in developing countries up to silo storage loads in farms. Once a year every year, all the crew of the London Zoo is on the deck for the annual weigh-in of the 19,000 animals residents of the ZSL London Zoo. From tiny frogs to Lions, Giraffes and Elephants, all animals need to be weighted in order to monitor their well-being. This exercise requires all sorts of scales and balances adapted to each animal size. Zoo keepers have to be creative in order to get the creatures let them take their measurements. The data collected is then shared with other zoos in a global database that provides key information for nature conservationists in programs designed to preserve endangered species. As you can see, some animals need to be lured with treats in order to get them on the balance scale. Tammy, our tree anteater, gets some tasty treats during her weigh-in. Our keepers look happy with our camel’s weigh-in result. The great Animal Weigh-In happens once a year during the summer holiday. Low Fat Diet. Weight loss and fitness demands following a wholesome diet, low in calories. You’ll also want to make sure that you get enough sleep, as this might be affecting your health without you realising. If you don’t sleep very well, then one thing that you could do would be to get yourself a new mattress (why not check out something like this memory foam mattress here?). Additionally, you have to be compelled to move daily, combining cardiopulmonary exercise with workouts that improve your strength, flexibility and vary of motion. Effective diets provide you with flexibility in your food and exercise prepare therefore you may confine form even throughout times of stress or changes in schedule. Speak along side your doctor concerning diet goals if you have health considerations. During meals, set your ware on the table between bites and sip water to block your uptake therefore you are feeling fuller sooner. once you are feeling the impulse to eat as a results of unhappiness, stress or anger, breathe deeply and picture yourself during a peaceful, lovely place, attempt meditation, a walk or yoga instead of uptake senselessly. Each meal and snack can feature one portion of a full grain or legume, like lentils, white beans or spread. 3. Exercising 3 times a week at least for 30 minutes also contitibutes to staying fit. Stress, overwhelming daily issues and bad eating proneness affect being underweight, which consecutively dispossess your body of calories and essential nutrients (vitamins and minerals). All these components can originate early greying of hair and deterioration of your health. Rough skin is an indication that your body lacks vital nutrients necessary for growth and well-being. This has been revealed that items which seem to help the healthiness of underweight all of us are: muskmelon, figs, raisins, materials funds, muffins, pasta, crackers, and also bagels. In order to get weight you should eat and drink better calories designed to come solely from carbohydrates. You probably should really place physical exercise and also weight lifting to the everyday routine so as to prevent gaining too much weight as fat. What is more, water ought to be taken half-hour before or one hour once meals. The intake of occasional tea and soft drinks ought to be lessened. Walking, yoga, massage and diversion all cut back stress, induce smart sleep and facilitate increase weight. Subsequently to its birth, the little baby is deprived of the necessary nutrients which were available in the time of pregnancy. This results in the 5-10% weight loss. However, with a steady and correct diet set by the doctor, the newborn easily reclaims the initial weight 10-14 days after birth. At that point, it is a good idea to estimate weight with so called baby-scales which are available on the market – for baby comfort reasons as well as carefully examine the growth in the baby’s mass. As days pass by, with an appropriate diet a gradual increase in the baby’s weight can be observed. Parents should monitor their baby’s weight and note down the observed weight improvements for health reasons. It is believed that the baby’s weight should increase by 175-225g per week. By the end of the 6th month the child usually weights twice its initial weight after birth (which is usually 3 kg). Without any doubt, it is a good idea to consider buying a baby-scale in order to make sure that your child gains weight safely. More advanced calculating scales which are employed only in supermarkets or hypermarkets are equipped with a printer enabling purchasers to actually do the weighing themselves. What the consumer does is that he/she takes the desired number of fruit or vegetables, puts them on the scale and presses the button which has a drawing of the particular fruit or vegetable on it. When the scale has done the counting, it prints a special label with glue on it which can be easily attached to the product. Such an operation saves a lot of time for the cashier who does not need to weigh the articles. Clients usually also appreciate it when their time spent by the cash register is as short as possible.